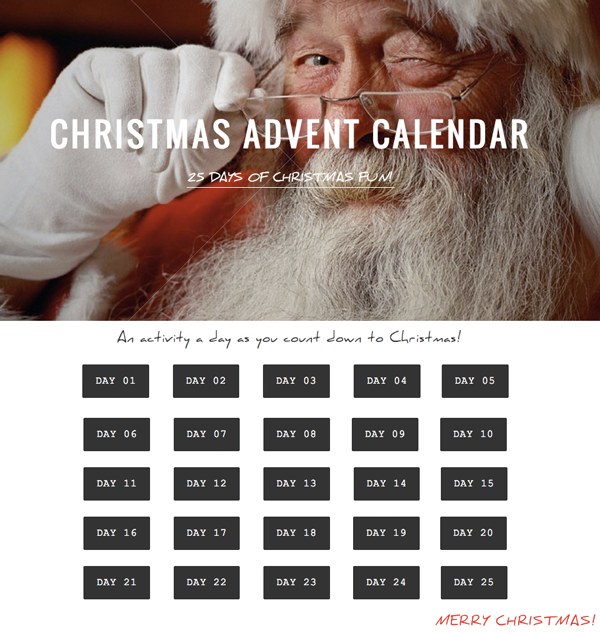 If you celebrate Christmas at your school or with your children at home, you can create a simple digital advent calendar to surprise your kids with a different activity a day! Signup for a free Weebly account. Choose a website layout and add images and adjust the typeface to give it a Christmas theme. Weebly is a super simple website creator with a drag and drop feature, no coding required. To make your calendar, drag "buttons" located under "structure" in the left side panel. Type numbers in each button. To arrange the buttons in a grid, move around the "dividers" and align buttons left, center or right until they are lined up. You can add dividers which are also located under "structure." If you want to make special buttons, you can upload them as images. Once your site is laid out, add links! Click on each button, hit link and paste the website url for a fun activity. That's it! You could even have kids write a special message or create a video message for some links and share with the parents of the students in your class. Parents will enjoy seeing what's next on the advent calendar. As a class, you could vote on what you should put up each day. Here is the link to the one I made featured left.